These units are manufactured according to the original engineering roof curb without structural modification. Unit weight is a critical factor where these units were originally installed because in many instances, the existing structures will not accommodate the weight of larger units currently available. Existing control zones and duct connections can be maintained without modification as well. Therefore, replacement of complete units can be accomplished quickly and economically to extend the life of existing facilities. 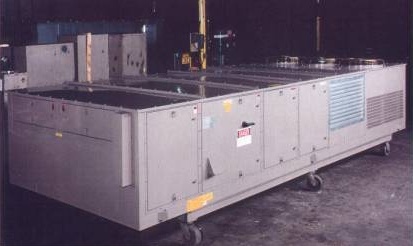 Exact replacement units also eliminate the need to retrain maintenance personnel. The Nesbitt replacement gas fired heat exchanger is designed for use in Nesbitt Rooftop outdoor applications. The heat exchanger is installed downstream from refrigerant cooling coils. The notable difference between the direct-fired heater and the familiar atmospheric duct furnace is the use of an inducted draft blower for control of combustion air and exhaust of flue gases. Corrosion of the burner is eliminated by the use of unique venturi burners firing horizontally and directly into the round primary tubes where the major portion of heat transfer occurs. 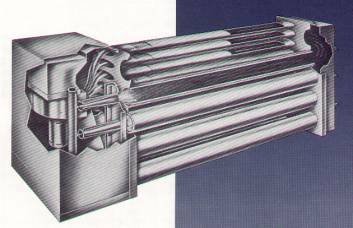 The oval cross section of the secondary tubes provides a high rate of heat transfer to the air while maintaining high gas velocities through the tubes. Primary and secondary tubes and the turning box are welded stainless steel.